The last Hewlett-Packard (HP) digital camera has been made - the company has announced it is to stop making digital cameras. HP will continue to sell branded digital cameras from other OEM manufacturers. But it will not be designing or manufacturing its own digital compacts. 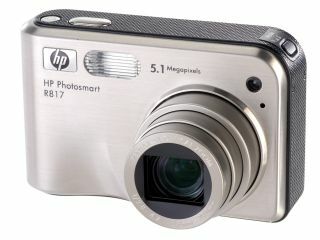 The two newest HP camera models (and therefore the last to be sold) are the Photosmart R937 and Photosmart R847. Instead of cameras, HP will now be focusing on its Print 2.0 strategy. It's a fancy way of saying that it sees more value in developing better and easier web printing services. So expect HP's existing Snapfish service to get an overhaul in the coming months. HP has traditionally focused on basic digital compact cameras, such as the 7.2-megapixel HP Photosmart R837, the basic 6-megapixel HP Photosmart M537 and 5-megapixel HP Photosmart M437. "The digital camera business... remains intensely competitive," HP told us. "HP made the decision to shift to a new business model for cameras -- one that will allow HP to continue to provide a total HP-branded digital photography solution ... and where we can add the most value over time." HP's camera strategy has been to offer products at a certain megapixel count at a lower price than traditional camera makers, such as Canon, Fujifilm and Nikon. But the market is currently saturated with cheap, high-spec snappers, and HP's basic models just haven't stood out enough to sell well. "HP had a good go at making its compact cameras work," says Geoff Harris, editor of Photo Plus magazine. "It added genuinely useful extras such as in-camera photo editing and aids for shooting in low light, and sold them with its printers." "The cameras were well designed and easy to use, but the company's lack of optical heritage - not to mention the fierce competition - was always going to cause them headaches. Not having a foothold in the keen amateur end of the market probably didn't help either."